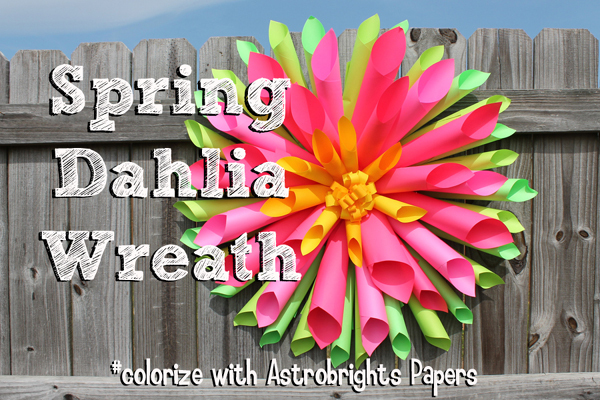 Doodlecraft: Spring Dahlia Wreath with Astrobrights Paper DIY! 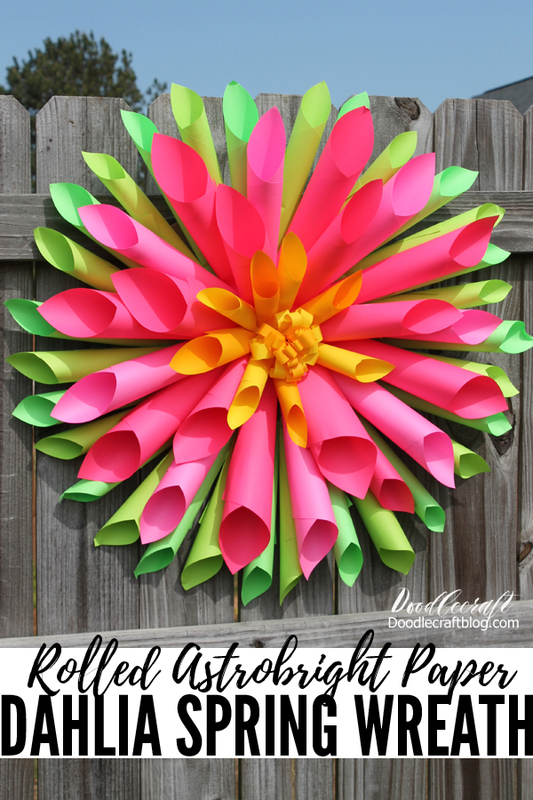 Spring Dahlia Wreath with Astrobrights Paper DIY! Making crafts out of paper is one of my most favorite mediums. They don't last forever, but they are bright and inexpensive to make. This bright Dahlia wreath is perfect for Spring decor on the front door or in the entry way. It's simple to make and just takes a few supplies. Decorate for Spring with vibrant paper! I recieved this beautiful and amazing package of paper! 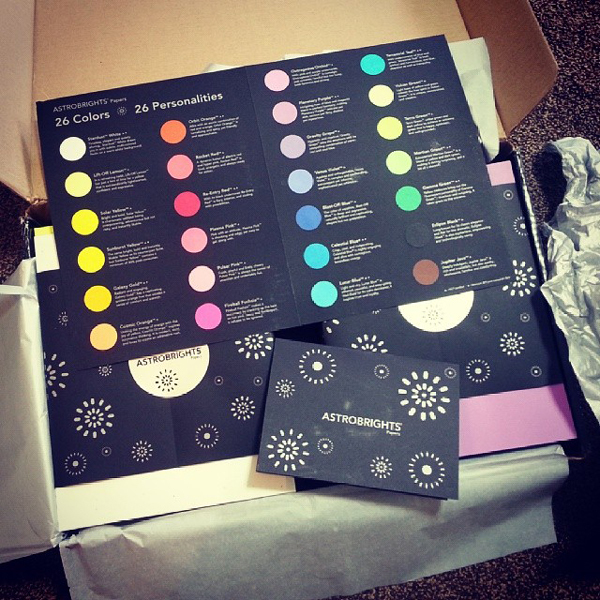 26 awesome colors...and I got a sample of all of them! I got sheets of printer paper and cardstock! What would you do with all this glorious paper--something extraordinary! Look at this great sample sheet of all the colors! My friend and I got together to make Rolled Paper Wreaths for Spring! They are so vibrant, they add the perfect POP to Spring decor! Roll the shorter of the sides and pivot while you roll, so the bottom left corner is the bottom tip of the cone. It takes some practice, but after 56 rolls...you'll be pro! After you roll the cone, hot glue the top corner in place. You are going to cut off the bottom tip in a minute, so make sure you are gluing at the top of the cone. I alternated my greens. Cut about 2 inches off the bottom of the cones. Begin gluing them around the cardboard...about 4 inches down on the cardboard, and slightly overlapped, but shooting out like rays of the sun. Until they are all glued down. Then I rolled 22 pinks! Again, trim off about 3 inches and glue them around the cardboard further in the circle. Slightly overlapping and alternating colors. I used all but 6 of them. Then the remaining 6 were cut another inch shorter and placed inside the center. Then I cut 2 sheets of each yellow in half. Rolled them and added them to the center. It looked good...but the center needed something. I took 1 sheet of paper and cut it in half, then cut slits in it every half inch but didn't cut it all the way through. Then roll it up, glue it in place and curl down the fringes. And again with another half sheet of the other yellow. Then I hot glued it right in the center!